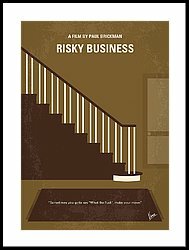 My Take on it – As a child of the 80’s, Risky Business will always be a film that has shaped the way I think of teenage comedies. Even watching it again 33 years after it came out, it’s easy to identify what makes it so fun to watch. This movie us filled with many iconic scenes that have endeared it to millions. Who can ever forget the underwear dancing scene? or the Porsche in the lake scene? or the way that this movie changed how people thought of the Bonds they received from their grandparents? For its time, it was very risque and helped the deluge of similar themed films make their way to the big screen. Tom Cruise is very likeable as the main character Joel and it’s easy to see that his charm and charisma hasn’t faded in the 33 years since this film came out which still makes him an actor in high demand for any film that they can get him to be a part of. Rebecca De Mornay also got a huge boost to her career with this film, but I personally think that she and Cruise don’t have such great chemistry together as most would presume in this film no matter how good she looks. Bottom Line – Fun movie that isn’t as good now as it was 30 years ago. Cruise is quite likeable here as Joel and we get to see the charm and charisma that has helped him so much over the years. Movie is filled with numerous iconic scenes and the plot ideas are quite unique. As great as De Mornay looks here, I can’t say that the chemistry between the two leads works as well as it should. Recommended! I watched Risky Business for the first time the other day and I really enjoyed it. Any other comedies from this era that you recommend? Lots of great ones. Have u seen trading places? Planes trains and automobiles? Stripes? I haven’t seen this one in a hot minute, and I definitely need to revisit it! Great post! Be honest Rob. How many times have you down the slide? In my underwear? Actually never. U?